Unit Converter Kit is a free Windows 8 unit converter app available under ‘Tools’ section of Windows 8 app store. 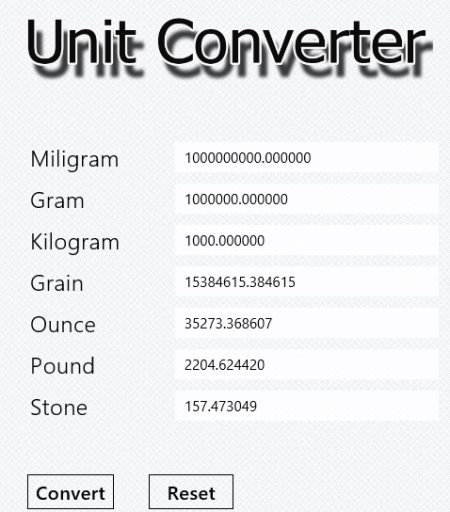 This unit converter Windows 8 app allows you to convert values in one unit to another. There are 3 different categories of measurement: Weight Converter, Temperature Converter, and Length Converter. Each category contains a list of related measurement of units. For example, Weight Converter contains Milligram, Gram, Kilogram, Grain, Ounce, Pound, and Stone. Similarly, other categories contain related units of measurement. As you open the app, you will find units of measurement at the left side and all the categories on the right side. All you need to do is just select a category and input a value from which you want to convert and click on ‘Convert’ button ? it will convert the value to all the available units. You can also reset it using ’Reset’ button. Let me quickly point out the main features of Unit Converter Kit Windows 8 app below. Lets you values from one unit to another. There are 3 different categories: Weight Converter, Temperature Converter, and Length Converter. Reset button lets you reset the converter and you can can convert new values. Just input a value and you will get the result in all the available units of measurement. Well.. it’s a good utility Windows 8 unit converter app where you can easily convert between two or more units of measurement. It’s a must trial app. Also, check out our posts on Unit Converter Apps, BMI Converter Apps, and Expense Tracker Apps. Click on ‘View in Windows Store’ to get the downloading link. Proceed with further installation steps and get it now. In short, Unit converter Kit App is an extremely useful converter that helps you convert between different units of measurement. Go ahead and download Unit Converter Kit app in Windows 8 now.